The chronicle of my journey into prototype modeling. The other accomplishment today was to construct a support stand that will slip under the hinged switching lead that has been installed on the north end of Calais Yard. After laying out the yard tracks it became obvious that if I ever wanted to operate Calais, I needed a lead track to complete a decent run-around. 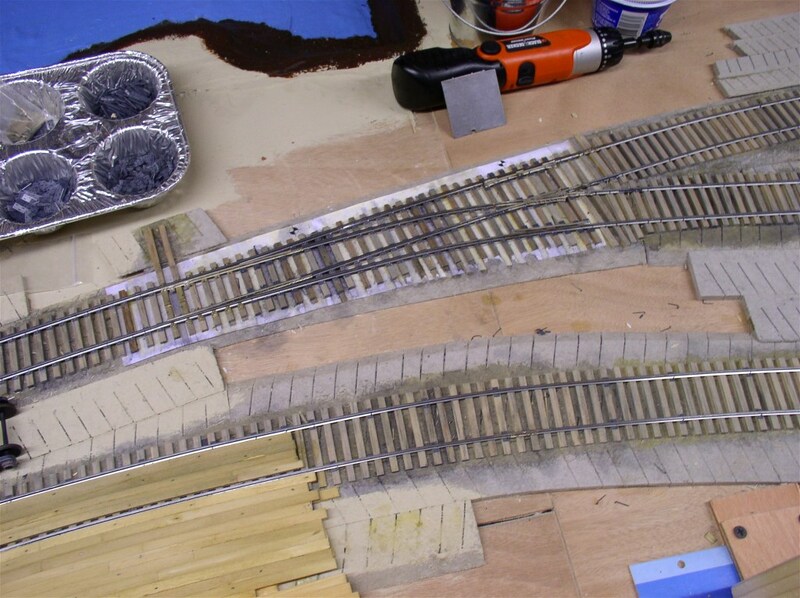 You can see the base board for this a couple of posts back on the end of the DCC panel. Normally it hangs vertically to stay out of normal foot traffic, but when needed it is swung up to a horizontal position. The stand holds it in that position until no longer needed. 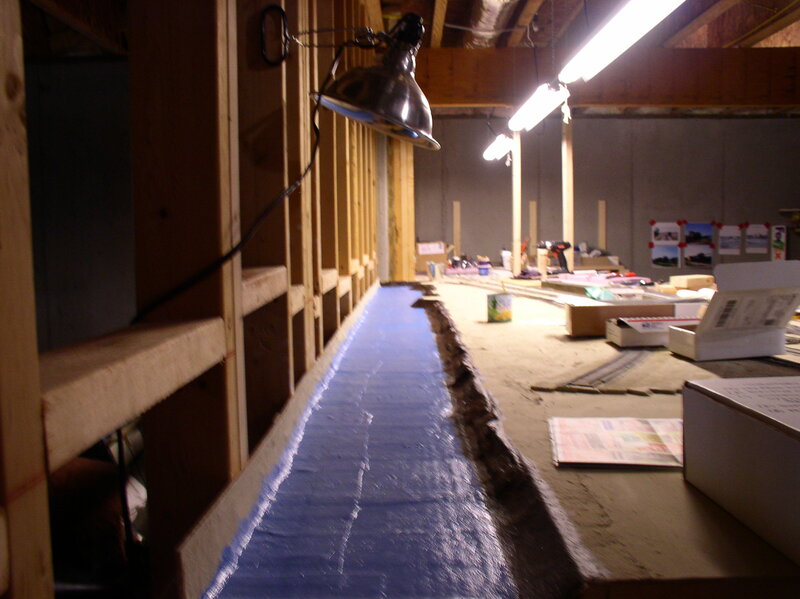 Once the track is installed on the base board, I will show the intended use. 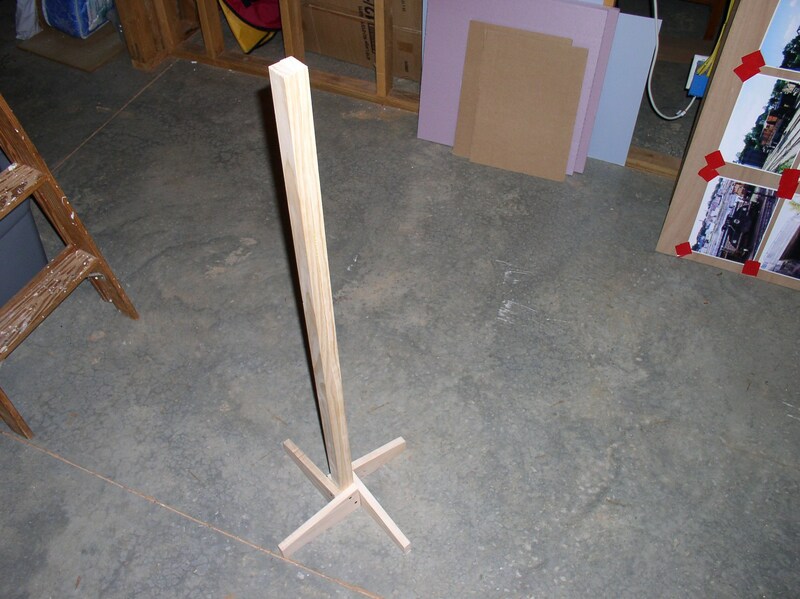 Today’s photo is just the stand itself. I probably shouldn’t call it that, but this particular switch will be partially under the dividing backdrop between Calais and Ayers Junction. That will be the frog end. The points and throwing mechanism will be exposed. Murphy’s Law says that what can go wrong, will and this last switch in Calais has the potential to give grief. Of course I will be careful to get everything as smooth as possible and tested, but the potential still exists. Nevertheless, it is great to get this far in the construction. I now need only to get the servos working before I can leave town to begin on the next section. I was back at it today after taking a day off yesterday to host my friend Chris Elliott. Although I was actually working on another switch today, I took some photos to show progress on the fascia wiring. As I mentioned earlier, this style of wiring is what I had on my former railroad. It always worked and I am comfortable with it, so I will continue to utilize it. It is basically a heavy twisted pair of wires that terminate in terminal blocks every so often. The intermediate terminal blocks give space for various connections to track feeders and control boards. Each frog of the switches is connected to a rapid action device called a ‘frog juicer’ This device automatically changes frog polarity instantaneously if a short is detected. 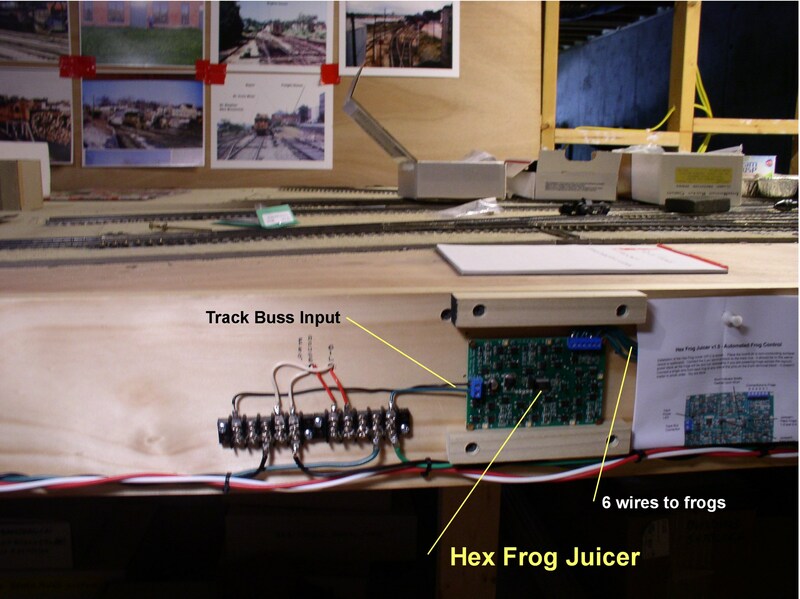 The main track buss is the input for this device and the output is a single wire to each frog. One of the reasons to use this method is that I am using miniature servos to move the switch points. These servos have no contacts as means of changing frog power like a Tortoise switch machine does, so the ‘juicer’ is an alternate method. The word ‘hex’ means that this circuit will enable 6 different frogs. There are two independent busses shown on the fascia. The one with green and black wire colors is the main track power. 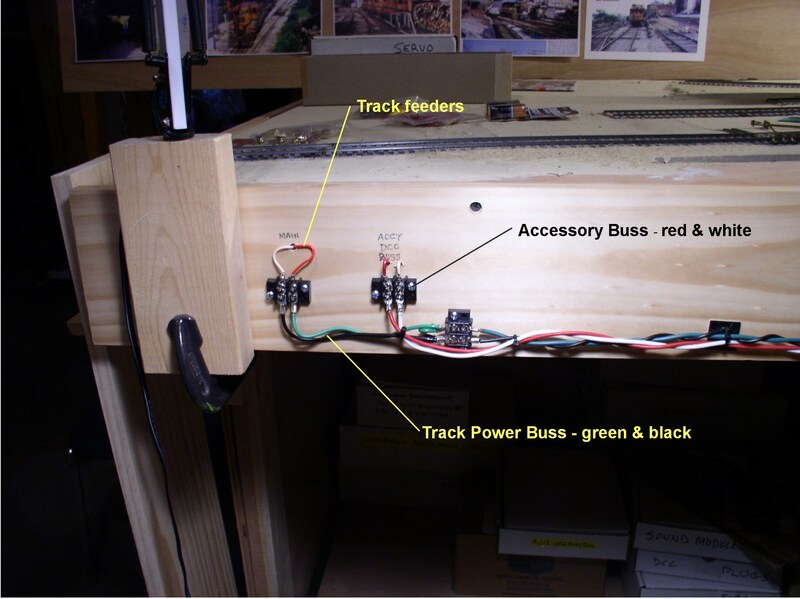 It is shown connected to various track feeders via terminal blocks, and also an input to the ‘juicer’ .The red and white wires carry the DCC power to the servo controllers. The controllers have alternate push button control, but the main reason the controllers are connected to the DCC power is to allow individual addressing of each servo as an accessory. As the ‘quad’ name indicates, the controller shown enables four different servos. At one point one of the ‘paint fairies’ showed up and before I knew it the St. Croix River banks were darkened like damp mud. Yesterday I wrapped up getting the power supply ready. 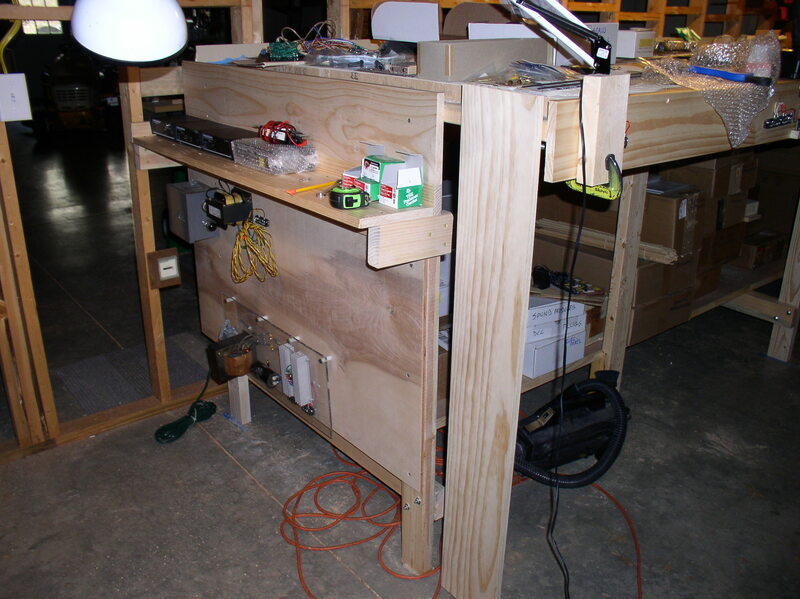 The components were all ready mounted, so it was a matter of wiring everything together. The upper shelf holds the various DCC components and the vertical surface below holds the main power switch and pilot light to show when the system is on. As I mentioned earlier, I am a strong proponent of a single switch which is the only way the railroad power can be turned ON and OFF. Here is my main switch which turns ON/OFF the 18 VAC transformer which is the supply for all of the DCC section. The main switch also turns on a power strip below to which other system components can be plugged in. 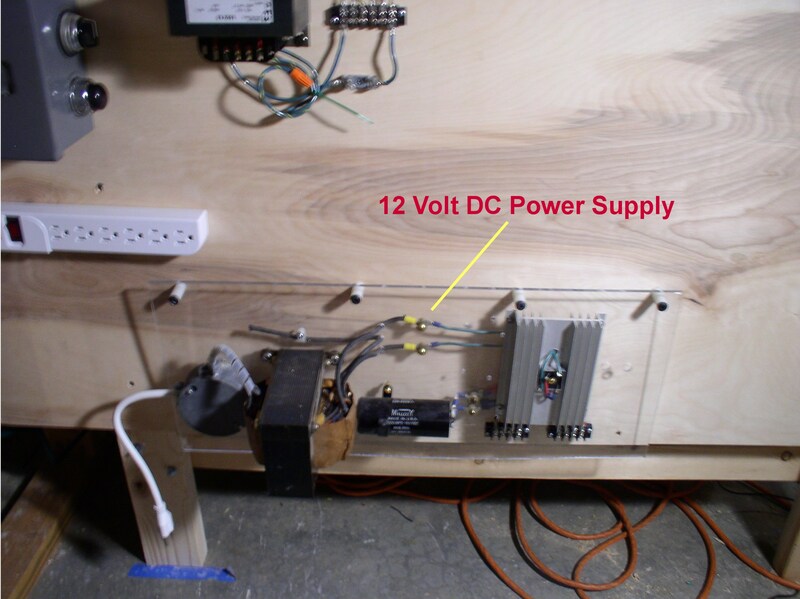 The 12 VDC supply below is one such component that will be plugged into the strip. The DCC components consist of a command station and two boosters. 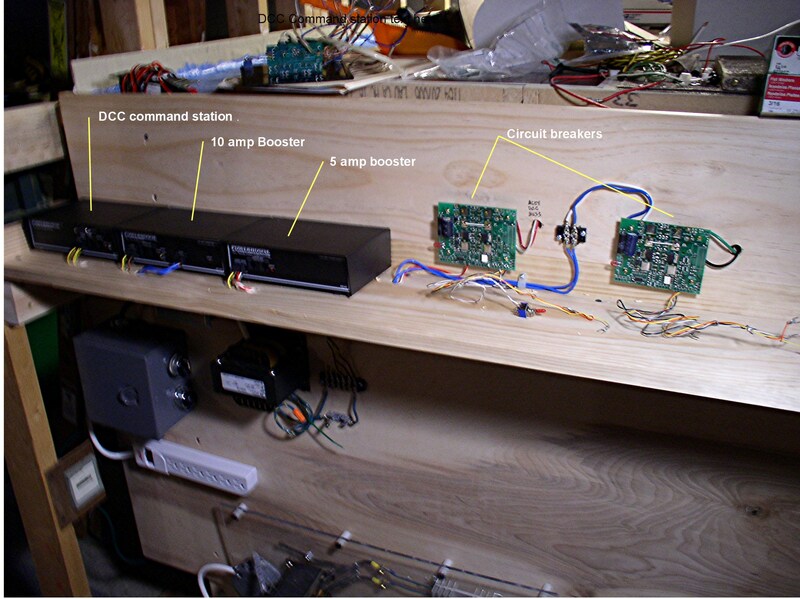 The 10 amp booster services the railroad and the 5 amp booster takes care of the accessories such as the servo controls. Each of the boosters has a high speed circuit breaker for protection. The next task will be to prepare and install the busses that will run along the front fascia. Up until now the wiring has been done without further checking. 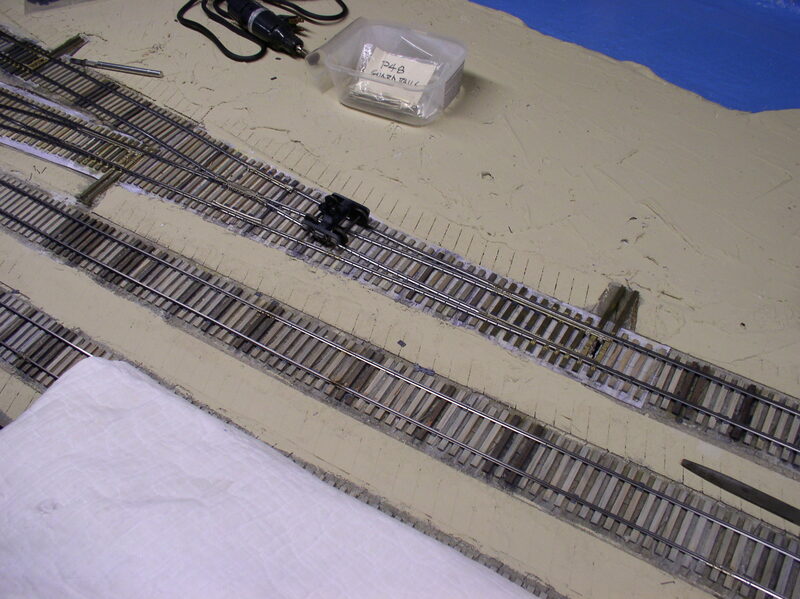 Only continuity checks have been made as each rail connection was brought out to the front fascia. I am fast approaching the point however that I need to get the servos connected and that means having the DCC source available. 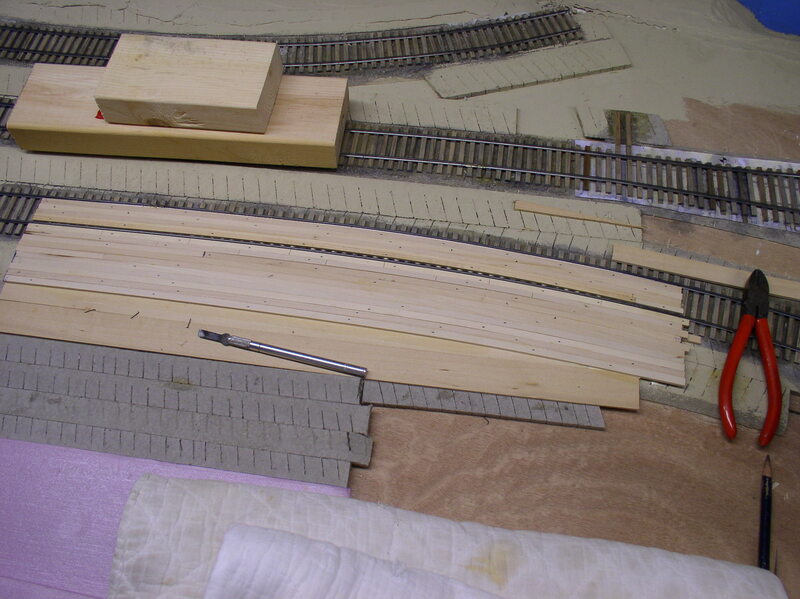 I added a plywood backing panel to the end of the Calais Yard section. This will be the location of all power to the railroad. The shelf will hold the DCC command station and boosters plus breakers. The boosters are both 10 amp and 5 amp. 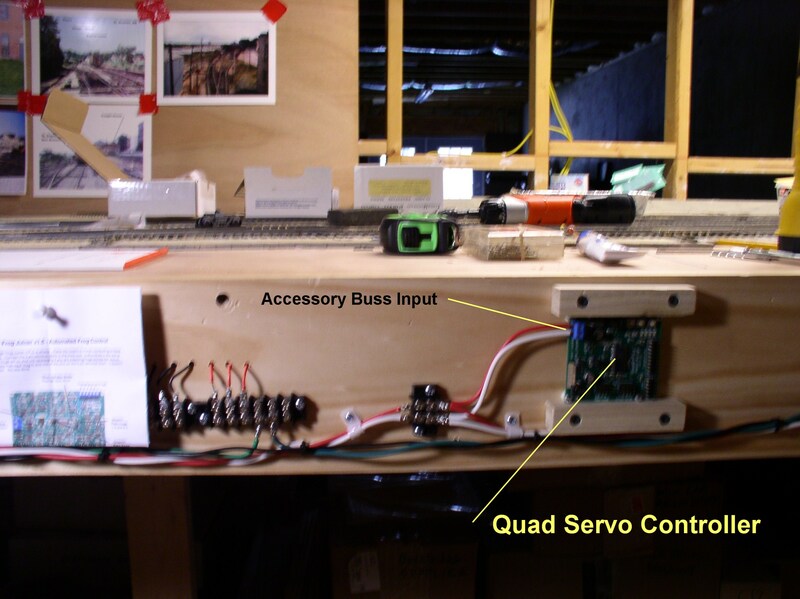 The latter will be used to power the servo equipment primarily and we keep that part of the railroad separate. 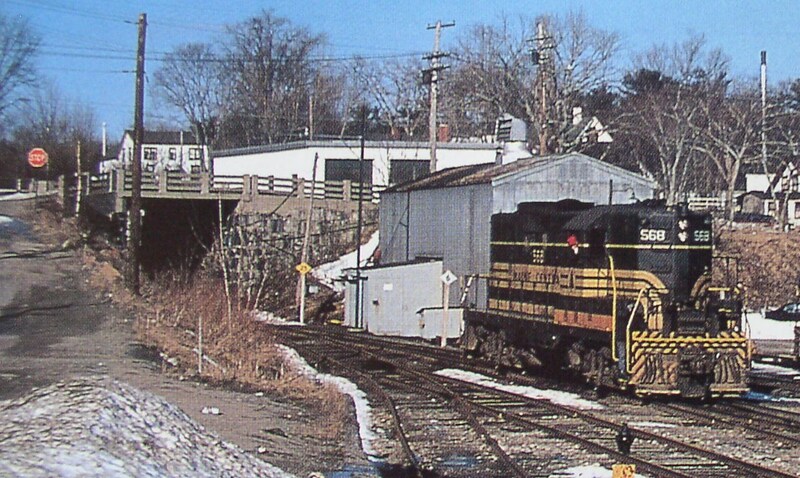 The 10 amp booster for track power will be adequate , because the Eastport Branch only has two locomotives. The vertical panel below will be used for other main power input and DC power components. 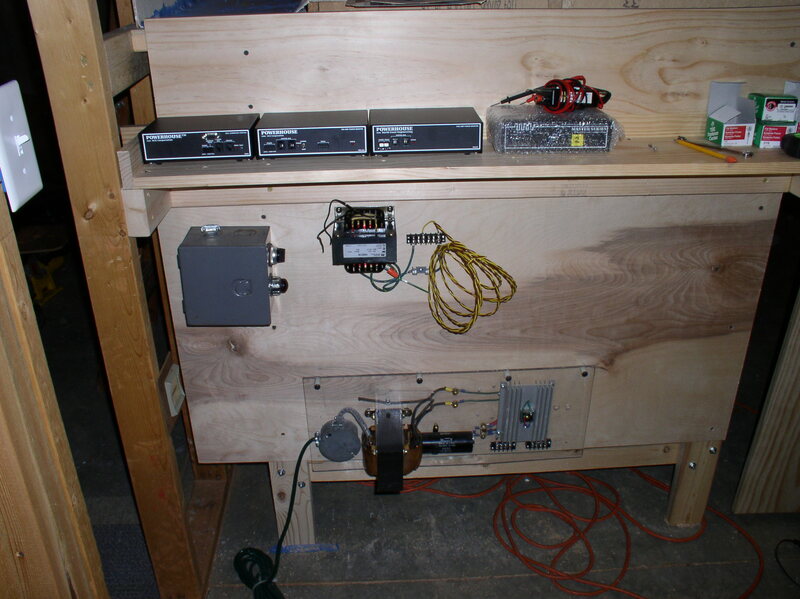 I have always built my own low voltage power sources and enjoy doing so. I’m old enough to recall that in some cases we had to build as there was no RTR available. I get a little disappointed with some of today’s generation who seem not only anxious to buy a ready made system, but often can’t figure what they need. 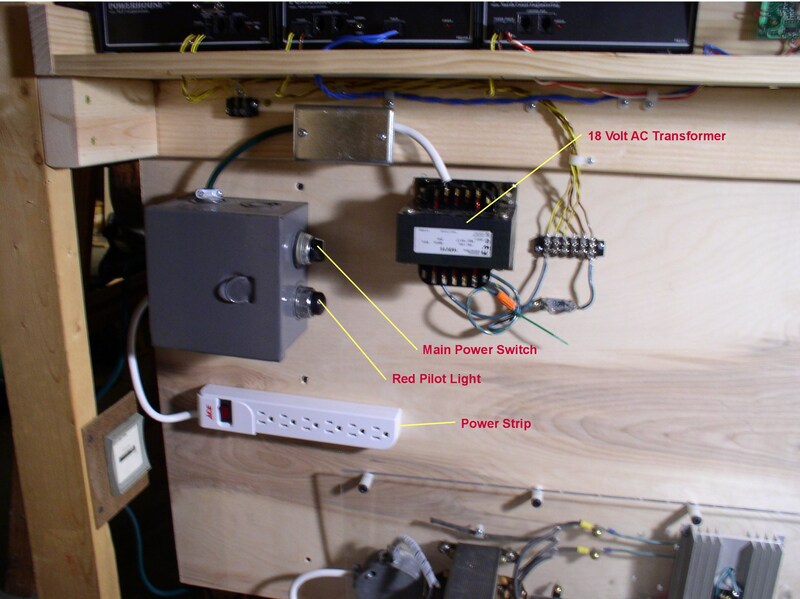 On the left side of the plywood panel is the main switch box (gray). I am a firm believer in having only one switch for all power. It also has a pilot light. To the left of the switch box is an hour meter which records the hours that the power is on. Once built, that will be the primary indicator of running hours on the railroad. Is that necessary? Not really, it’s more of a curiosity and both the switch and the meter are salvaged from a machine. The DC power supply is probably overkill for this railroad, but it is one that I already had and I’m not about to throw it away. The transformer to the right of the switch box is the 18 VAC supply to the DCC units above it. On the right end is a 1X8 board hanging down just beyond the end of the plywood. This board swings up into a horizontal position and will eventually serve to extend the lead from the end of Calais Yard. This will provide extra track length for switching the yard and freight house..
Other progress made yesterday was the installation of the station platform. Lots of weathering to do yet but the base is there. I apologize for the grainy photo, but sometimes you have to take what you get, especially when collecting old historic ones. Nevertheless, historic photos of my chosen prototype are endless sources of fascination as I study them. I was looking at the posted one recently. It is of the engine house or North end of the Calais Yard and the short tunnel through which a single track passes under Main Street. Besides the obvious GP-7 what else do you see? I’ll tell you some of the things I saw and what I am doing in response. First I saw snow, probably because it was March and spring comes slowly downeast. For that I’m doing nothing. That means what Mainers call the fifth season or ‘mud season’ which I find rather depressing. Next I noticed the speed limit sign indicating 25. Knowing the condition of the track I found that a bit surprising, but I’ll have to make one. Then I noticed the cast concrete fencing over the tunnel and along the road, so I set up a jig and made a few lengths to have when the time comes. The engine house has a strange looking swivel vent on its roof, so I made one of those. (the engine house was already built). There is a former gas station in the background. Mine has been built for a while now, being an Esso version from an earlier photo. It’s hard to make out, but there is a pole remaining from a telltale. It appears by the date of the photo the hanging ropes are gone, or perhaps I don’t see them. There is also a speed limit sign leaning against the building which says ‘5’ which I find more appropriate for the track condition. The power poles in the background have some interesting transformers on them along with the wiring. I’m not sure if I’ll go that far because it may be in the way of reaching into the scene. Of course the track condition begs to be modeled the way it is. What do you see? The St. Croix River is a tidal river that divides Calais, Maine from St. Stephen, New Brunswick. The normal view from the USA side is looking across the MEC rail yard toward St. Stephen. This is the view I am modeling. I am compressing the scene by way of the height which means that I will be looking across the yard and then the river, and then St. Stephen. The modeled river is much narrower and I am hoping that the eye level view will distort things enough to make it seem natural. You will note that the painted color is a rather bright blue. There will eventually be a backdrop view of St. Stephen installed on the wall behind the river. 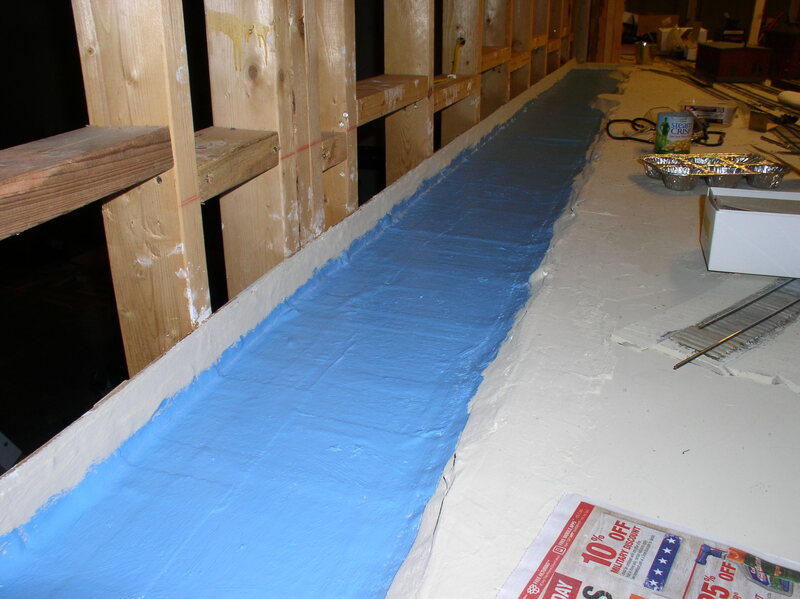 I intend that the bright blue will look as a reflected color from the back drop. In photos that I had from the scene, this is the impression. Today I had two helpers appear who wanted to paint the river. One is my wife and the other is one of my granddaughters. 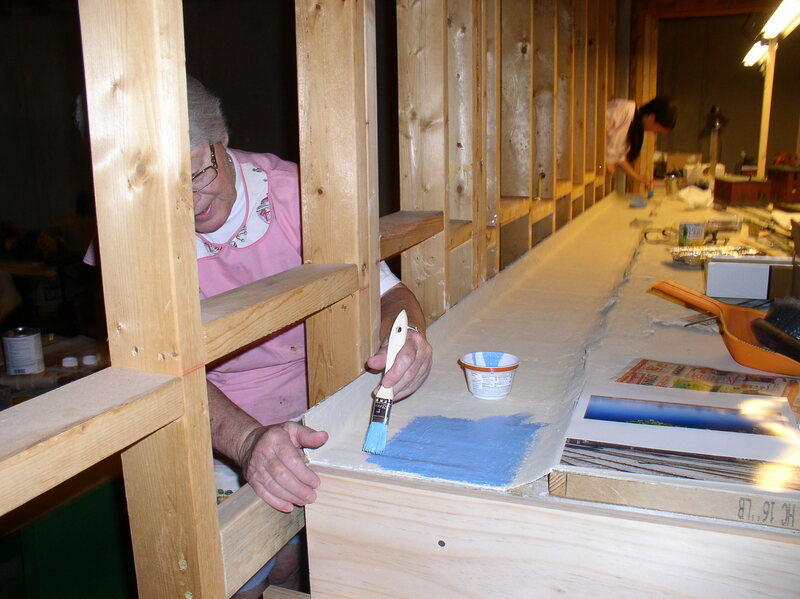 Without the backdrop installed it was easy to reach thru the stud wall to paint. The next step will be to paint the river bank. 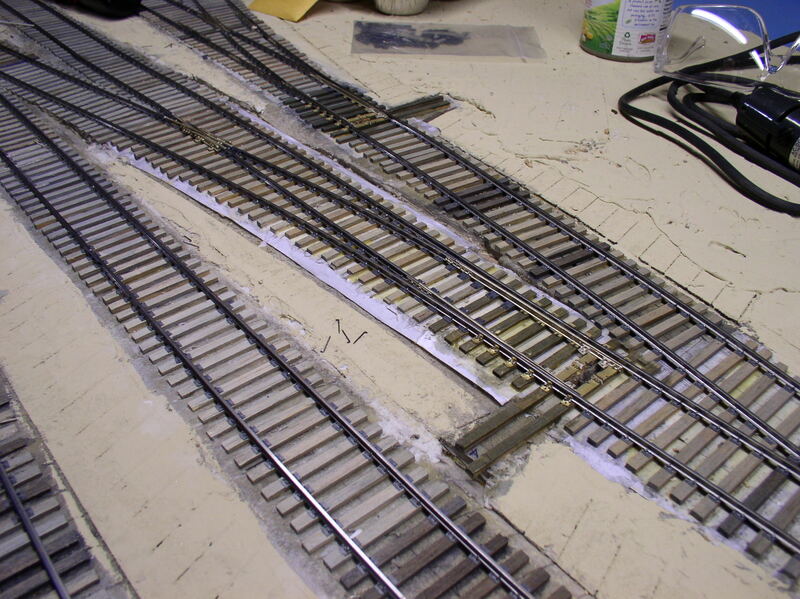 While they were painting, I was working on wrapping up the placement of the remaining switches in Calais Yard. All are now completed except for the wiring and the servos. The next three switches lie ahead at Ayers Junction. I have yet to finish installing the required tie plates, But that task is getting closer each day. I’m anxious to try out some scenery techniques, but first there is much in the way of tie distressing and track work painting. All in due course….